Modern Dubai was designed on a grand scale with ultramodern high-rises and genius development concepts. But among the wonders and innovations, among the millions of tourists who marvel at them every year, there is a grand life on the small scale in expat communities. Who would move to the Middle East? Professionals in search of challenging and rewarding careers plus fun. When I stayed with my friends on The Palm six weeks ago, I found out how much there is to do in Dubai. I could have been content just sitting on their patio next to the pool and looking at the Gulf, but they have so much more, with the possibility of a social calendar to rival with the Windsor’s. Who do the expats hang out with? The most important life-abroad asset is friends. Since few expatriates have extended families around, they create their own families. They find people with similar interests—co-workers, neighbors, sports club members, or parents of their kids’ school friends. (Dubai has excellent American-curriculum schools.) My friends connected with lovers of music, food, tennis, and golf. My kind of people. What’s Dubai’s music scene like? 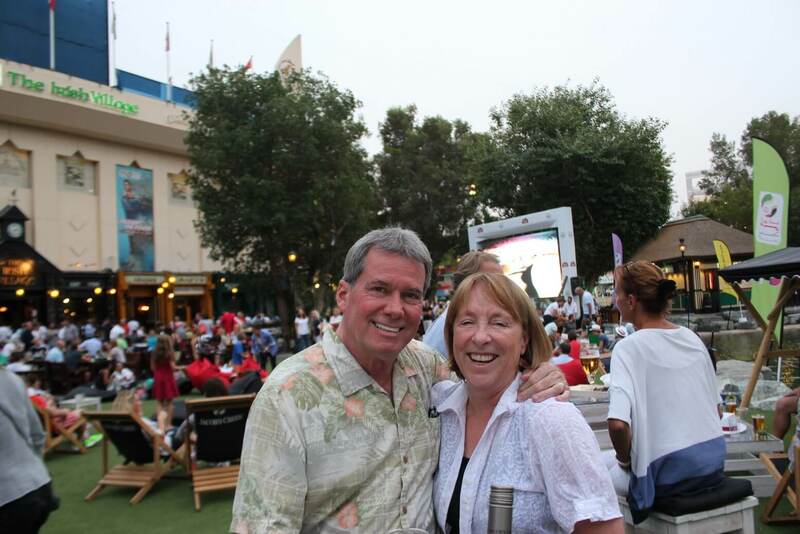 While I was in Dubai, the Jazz Festival was on with Santana as the headliner. Big acts come through Dubai. When I was teaching in the Middle East, I found my class empty one day because a bunch of students had gone to see Shakira when her Hips Didn’t Lie. For those who prefer classical music, Placido Domingo is coming later this year. Dubai’s exotic clubs attract the glitterati. My daughter-in-law ran into Chris Pratt (Parks and Rec) at a club the week before I arrived. Mind you, I’ve not had such encounters. Once on a girls’ night out, my friends and I wandered into a cool jazz club that was empty. Maybe 9pm was too early. We danced with each other, which was kind of weird, and as we returned to our table, the band played the theme song from Desperate Housewives. We kept walking. You can find good food everywhere. 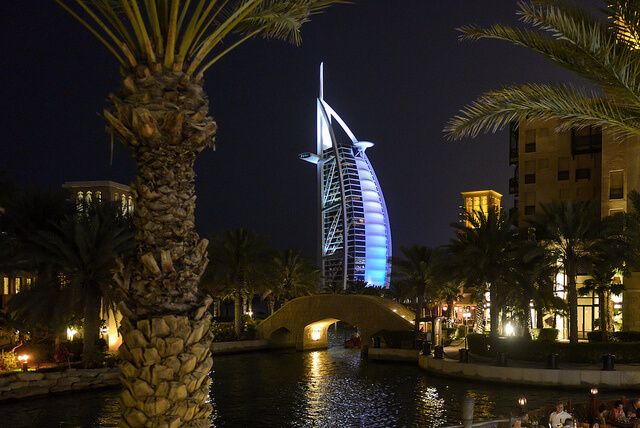 The feature photo above is Madinat Jumeirah (the Jumeirah neighborhood). The souq offers several options for outdoor dining on the water, or you could go to one of the hotels for fine (finer) dining. What’s the sports scene like? 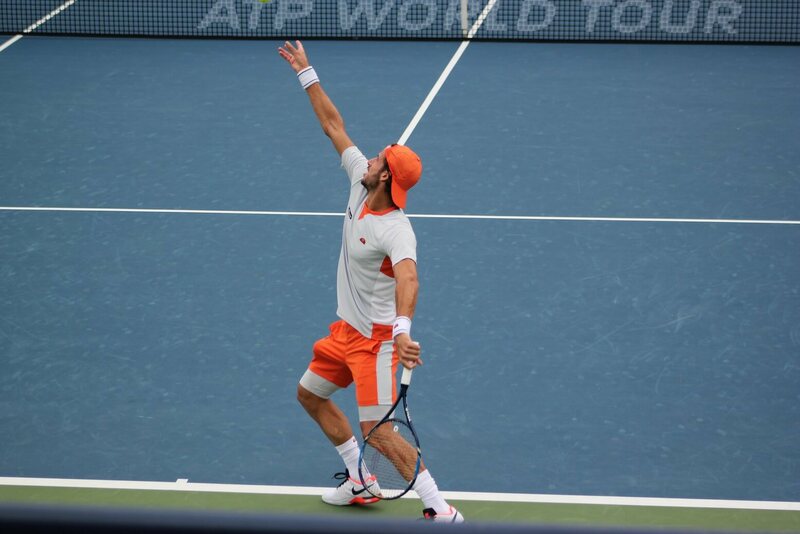 Tennis has always been the sport that draws me to Dubai. 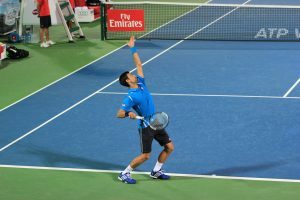 My first visit was ten years ago when I accompanied my high school tennis team to a tournament at the American School of Dubai. In the evening, I was thrilled to get tickets for the Dubai Duty Free Tennis Championships. 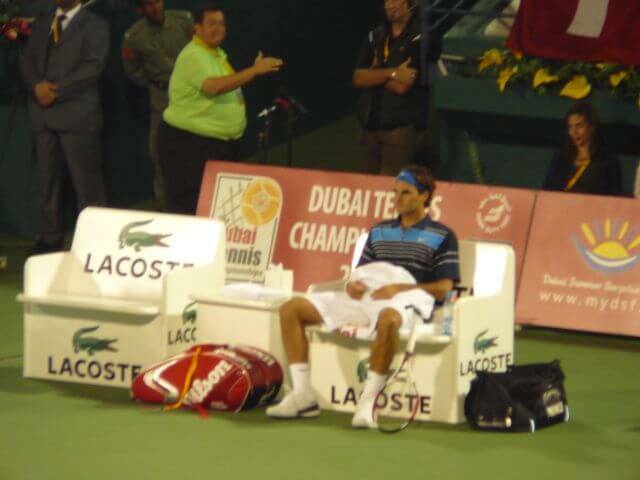 At that time, Roger Federer was at the top of his game. Unbeatable. He has always been a gentleman. Above, patiently signing autographs. 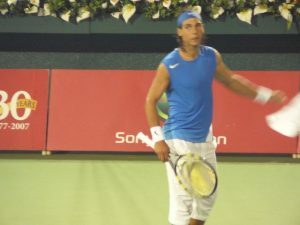 Raphael Nadal was Federer’s big contender. Always surrounded by family, his uncle was his coach with a rigorous workout routine. Our seats were close enough to see the results. Rafa was one of the few pros who didn’t look asymmetrical. He didn’t have the usual strong, thick serving arm, and thin tossing arm. 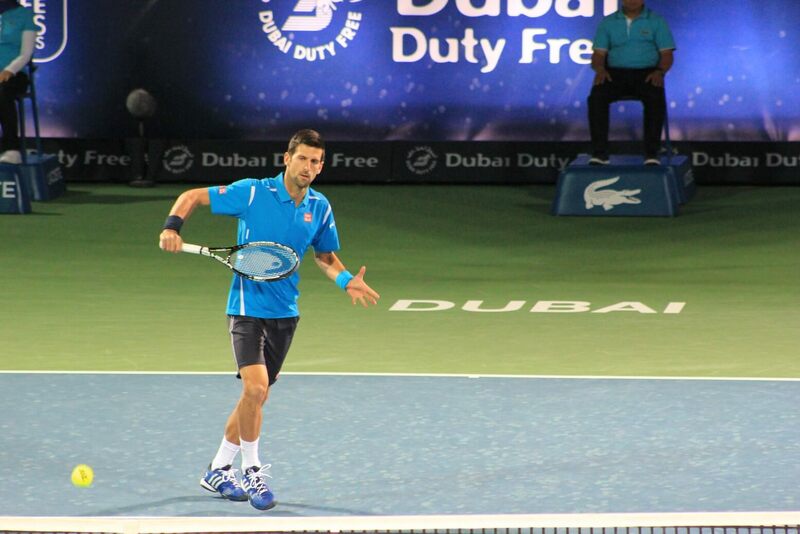 That year was Novak Djokovic’s Dubai debut. 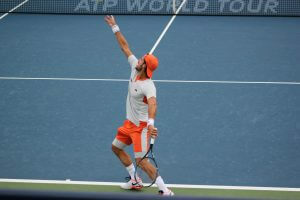 He’d made it to the quarter- finals, but didn’t have the clay court footing to contend. He’d rush to a shot but instead of stopping to hit, he’d glide along the surface like a water skier. 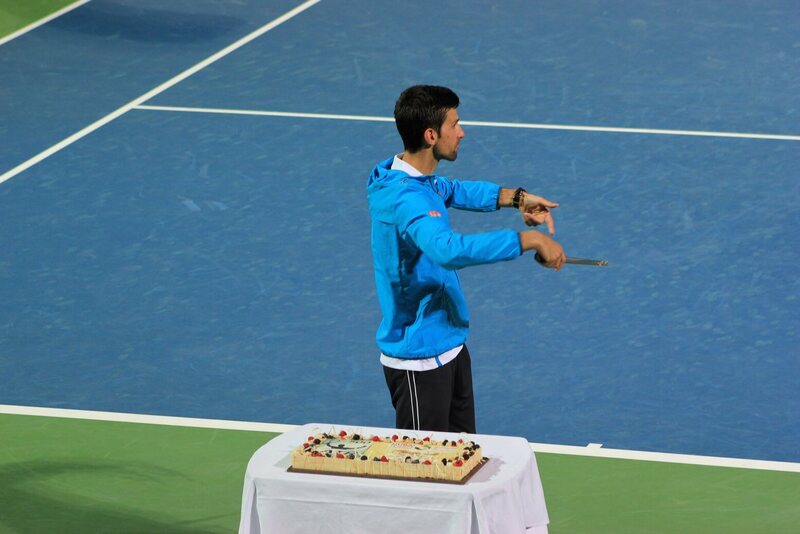 A few times he fell and someone behind me shouted, “You all right?” or “Can I help you?” Novak joked back. It’s a friendly tournament. That’s possibly when the media shortened the name Djokovic to “The Joker.” Now he’s known for his outstanding tennis and his humorous imitations of other players, especially Maria Sharapova. 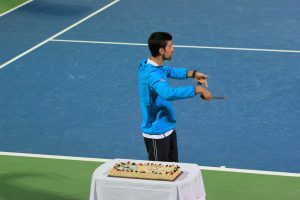 This year Dubai celebrated Novak Djokovic’s 700th tour-level win, and he humorously invited the audience to come down to the court for cake. 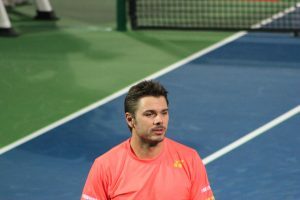 His play this year was spectacular—worthy of his Number One status—until an eye infection knocked him out in the quarter-finals. But that left center court open to up-and-comers. 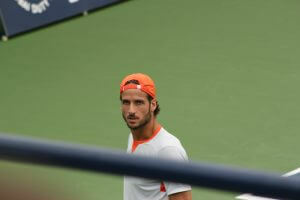 Feliciano Lopez (how’s that for a romantic name?) is the new tennis heartthrob. Here he is, up close and winning. I thought Lopez was looking at me the whole game—until I realized his coach was sitting in front of me. Darn. I also saw Swiss player, Stan Wawrinka, who won the tournament after No. 1 seed Djokovic had to forfeit. 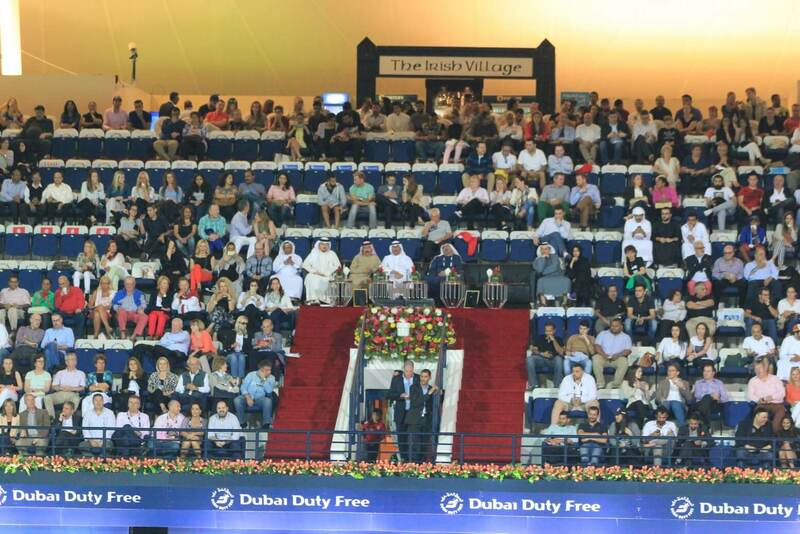 Though the Dubai Tennis Stadium is small and intimate, there’s plenty of room for the VIPs. The fans are tennis-polite. You can just leave a sweater on your seat, and no one will take the seat or the sweater. Under the stadium are several restaurants and pubs. 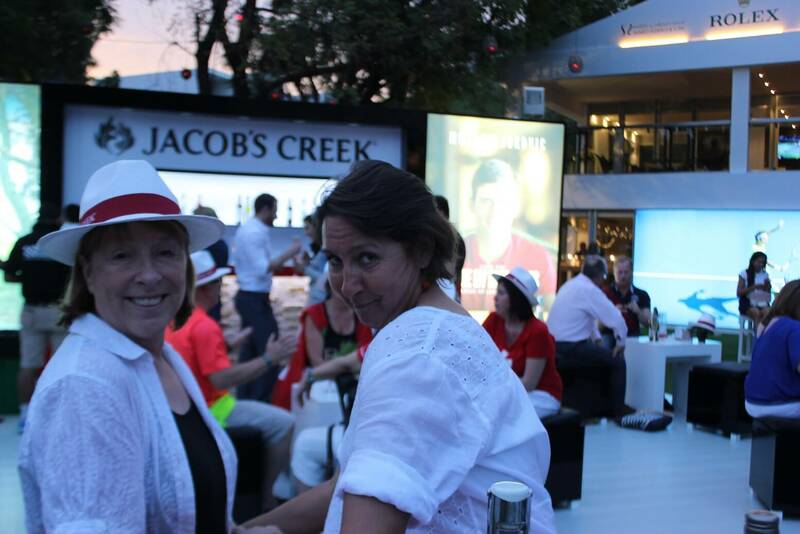 On the grassy area, the South African winery, Jacobs Creek, sets out tables and offers snacks, wine, and free hats. 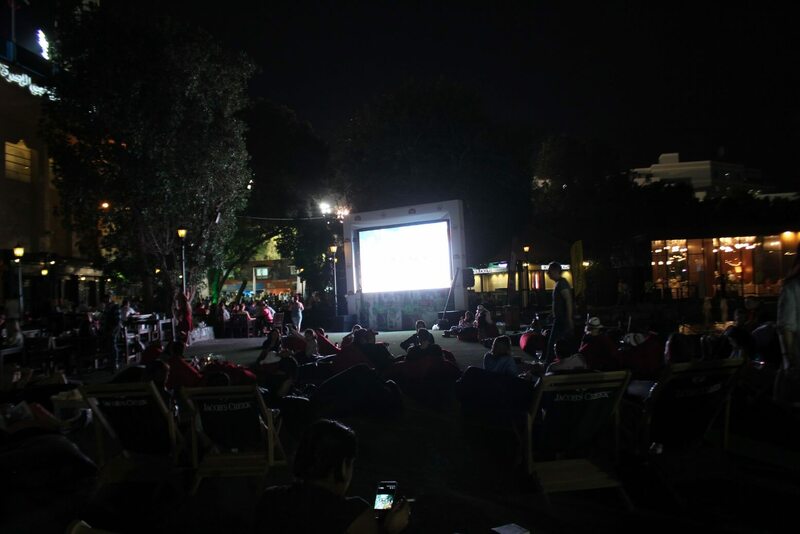 You can enjoy conversation with your friends and keep track of matches on the big screen. 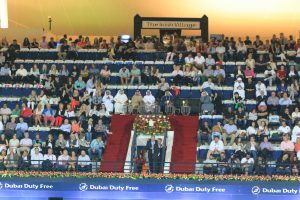 With so much happening, is Dubai safe? Street crime is low. You can walk alone at midnight or use the metro or Uber to get around. Of course, you have to follow the laws. There is zero tolerance for driving under the influence or for heavy-duty PDA. Neither terrorism nor gun violence has been a problem even though Dubai is in the center of a hot triangle, with Yemen, Saudi Arabia, and Iran at the corners. One afternoon this February, I turned on CNN. The screen lit up with stories about shootings and other violence in the US. There I was in the Middle East, having the time of my life, feeling completely safe and unafraid. Go figure. I am truly grateful for having had the opportunity to live in another country. I know a lot of people don’t have the situation where they can pick up and move overseas. But if you do, consider it carefully. As my son says, you learn something new everyday. For more photos from my trip, follow the Facebook link below. Great photos and insights into expat living in what is one of the most amazing places on Earth! There is truly something for everyone in the UAE!